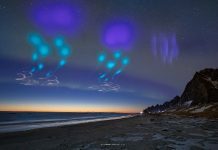 Global observations indicate that unusual sky phenomena continue to escalate in both frequency and intensity. Here some pretty baffling ones captured within the last few days around the world. Is this a contrail or a chemtrail? 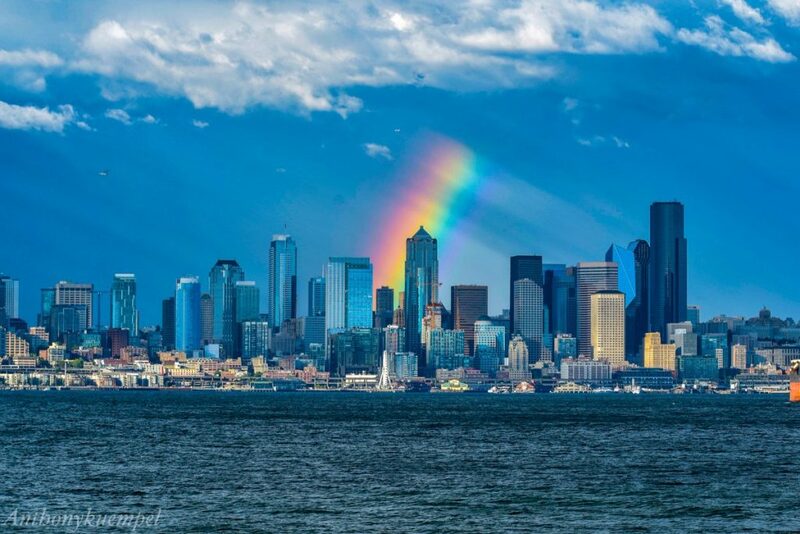 Look at the spectrum of colors. They are all there! 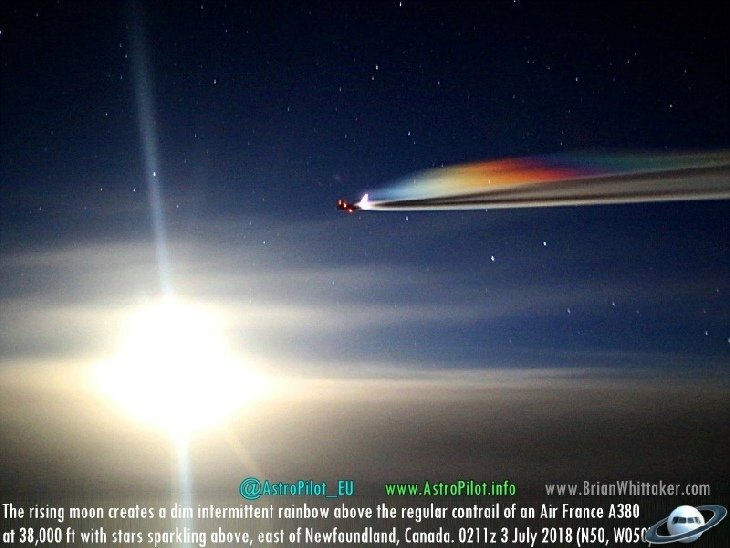 The rising moon creates an intermittent rainbow in the exhaust / spaying of an Airbus A380 at 38,000ft east of Newfoundland, Canada on July 3, 2018. 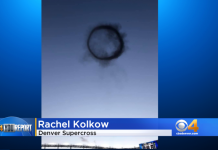 This phenomenon is created by air vortices that circulate behind the airplane and which create a low-pressure zone where condensation of water vapor can begin. When moonlight passes through the formed ice crystals, it decomposes into a spectrum (dispersion). Or it is chemicals? 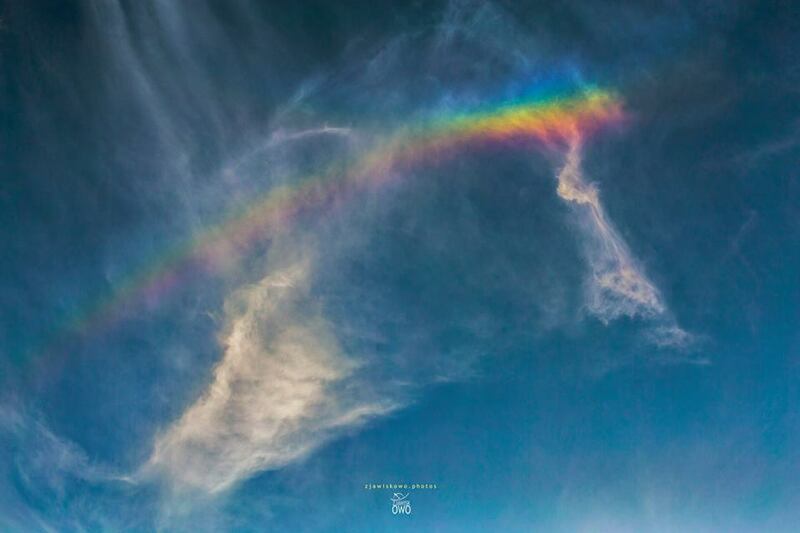 Finally, a partial circumzenithal arc and its tangent halo were captured by the camera of Paweł Kalinowski in the sky over Lodz, Poland, on July 8, 2018. Keep you eyes to the sky! You will get surprised! 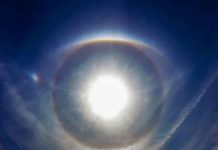 Since Galactic Federation of Light has come to the Earth in 2011, I saw this kind of rare rainbow many times. Their spaceships love to create beautiful rainbows to show people on the Earth. But people on the Earth are too busy to look up the sky. Now the victims (with heavy karma) of great flood in Japan have increased 220 including missing people. All the supermarkets and convenience stores are flooded in the flood affected area. Major companies such as Mazda and Panasonic have been closed because the major highways and roads are flooded and closed. Now it is extremely humid and hot (more than 30 degree, 90 degree in Fahrenheit) in Japan. A baptist church in Alabama was burnt down. All the satanic worshiping churches are going to be wiped out of the Earth. What people do not know is that the Christianity is the mix of Pagan worshiping Lucifer religion created by Reptilian entities. Because the ice of the polar region is melting rapidly, all the low-lying area are going to be underwater very soon. Beach erosion is the obvious symptom for that more water is circulating around the Earth. 50 sharks are swimming as a group. In Japan, people with accumulated karma (more like human disguised reptilians) were swallowed into the flood water. Altogether, more than 220 people died (This number might increase later up to 300). In Mexico, a car was swallowed into flood water, and then sinkhole with swirling water. More than 25 people were dead by train derailment in Turkey. Just so many things are happening right now. There is no savior (Christ is NOT your savior.) in this world. You (readers in this site) are the only one to save yourselves to do things for greater good to erase the negative karma you might have accumulated. Live heart centered with unconditional love. News report that more than 25 people are dead. This number might increase later on. On the end of this video, video camera caught purple orb around the Sun. I also took a picture around the Sun. Then I found a purple orb around the Sun. Suddenly that purple orb came down to just beside the trampoline my kids were playing. That purple orb, about the size of a yoga ball, stayed there for a while, then disappeared. I recommend you to take a picture around the Sun. It is high possibility you can find this purple orb, and it might come to you. Abandoned hospital in Japan with huge blood stain. This hospital has been abandoned for years, but all the surgical knives and some other stuff are quite clean and shinny inside of the cabinets. Blood stains all over the bed and curtain in examining room. Those blood stains look quite new. Some kind of human organ harvesting operation is going on in this abandoned hospital? The blood stain scene starts at 2:00. Alex Johns said “Democrats are saying this July 4th is the last one. Next year, there will be NO July 4th.” Those Democrats might know the secret knowledge “There will be NO country, USA by next July 4th. The country, USA will be disappeared by then.” That means all the countries and boarders will be disappeared soon. I Googled “coastal erosion 2018”. I’ve found so many videos on Youtube. The Earth’s water body is increasing rapidly. Case No.19 “Do not find us” note should had been written by Reptilians living underground.